Processed raw rice powder is prepared by washing raw rice, soaking it for an hour, then draining, drying rice and grinding into powder. This should be roasted till it turns light pink in colour. To this ½ a cup of lukewarm water mixed with ¼ tsp of turmeric powder and a pinch of salt is to be added. Water should be added little by little simultaneously mixing the contents also to avoid lumps. There may be some lumps in spite of this, which can be removed by sieving with the help of a vegetable strainer having big holes. These lumps are rubbed by hands so that they can also be used. The sieved powder is then kept in a vessel or plate with a cloth spread on it and steamed in the cooker as idli. This should be kept aside. Then jaggery is mixed with ¼ cup of water and heated to make thick syrup. When the syrup is dropped in cold water it should remain as it is without being dissolved. Now the grated coconut is added to the syrup and mixed with the steamed rice powder little by little stirring simultaneously every time the syrup is added. Cashew nuts fried in ghI and cardamom powder are added then. When the puttu is cool it should become dry and loose. If not loosen it by hand before it is served. In place of rice powder, rice can also be roasted till light pink and powdered in a mixie. For this a ladleful of jaggery more than the given quantity is to be used. 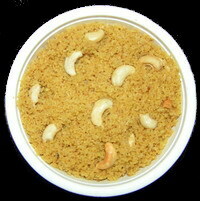 Grated coconut is mixed with jaggery in kaDAi , heated and sautéed till it becomes a mass. Now cardamom is powdered and added to it and kept aside. Black gram dAl with raw rice is soaked for an hour and ground into a smooth batter. 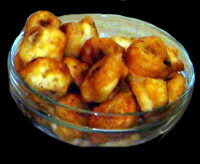 The batter should be thicker than the bajji mAvu. Refined Oil is moderately heated and coconut jaggery mixture is rolled into small dumplings (balls), dipped in the batter and dropped in the hot oil. After it turns golden brown, it is taken out from the oil. Suhiyan is ready. 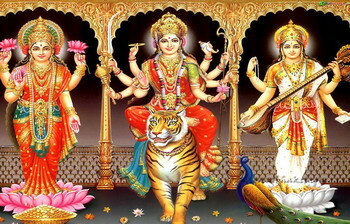 This entry was posted on September 19, 2011 at 11:07 am and is filed under Thamizh Festivals with tags arisi puttu, arisipputtu, black gram dAl, cardamom, cashew nuts, Durga Pooja, ghee, golu, grated coconut, gur, jaggery, Lakshmi, Navaratri, raw rice, refined oil, Saraswati Pujai, sooyam, suhiyan, suyyam, Tamil festivals, Thamizh, ulundu, uluttamparuppu, vellapputtu. You can follow any responses to this entry through the RSS 2.0 feed. Both comments and pings are currently closed.